I have been lucky enough to see a lot of our country and some other countries, but was not fully prepared for the grandeur of the “Lake” or it’s mountains and natural decorations. If you have ever been curious. Just go please. I will be back, you will too. 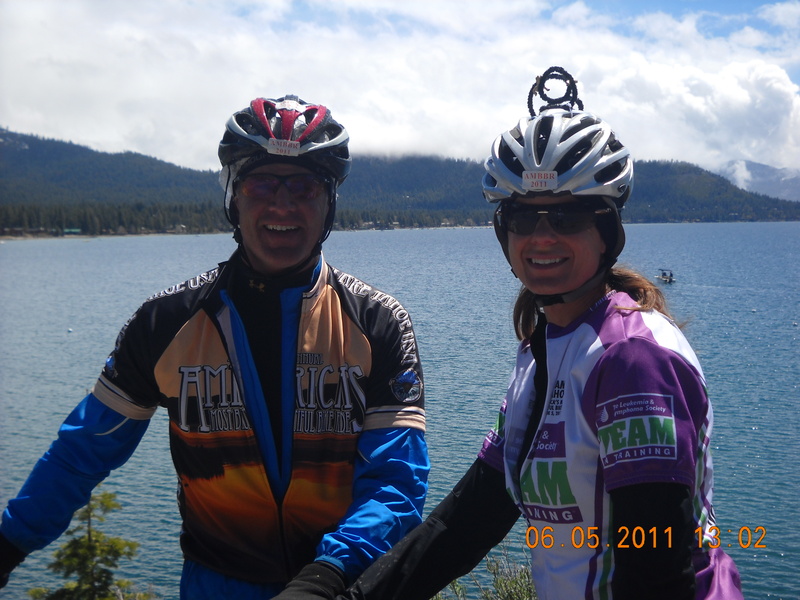 Preparing to ride 100 miles in the mountains is a fun proposition and months of training. Actually getting on your bike to do it it 40 degree rain is quite another. Yet, as many sadly cancelled their plans because of the conditions, thousands of us did not. After all, we were a part of a group that raised $6.8 million for this day towards the fight agains blood cancer! We proudly donned our goofy chapter helmets- my tornado included a horse, a cowboy hat, & a big horn sheep? lol. Patrick proudly wore his AMBBR official bike jersey- and off we went into the pelting rain. Before the first big climb to Inspiration Point we were drenched, frozen fingers and toes, despite high tech gear. Some of the warmest among us wore trashbags and saran wrap, go figure. The sweeping curving turns of the speedy descents were breathtaking and scary and colder still. Then Glory! The sun came out for let’s say 30 miles, just enough for the drying of clothing and the wiggling of toes. One last rest stop near mile 70 was sun filled- full of energy and rejuvenation, for the last BIG climb and storm we could see crossing the expanse of water. You can see everything from your bike here, if you look. We saw it coming and indeed their was no racing it, the sleet found us midway up the 8 mile climb and tried to put us in a prison of doubt and defeat. Today, however, this was not possible. We were in the presence of magnificence of creation and splendor all around us, even the nature of the cold sleet pelting your face added to the connection to the Earth. We saw not the cold or the obstacles, we saw the waterfalls, the boulders, the hints of teal water beneath us, the shimmer of the sun on the other side of boisterous clouds, smelled the overwhelming freshness of forest, thousands of years old. We saw not the mud, for we were part of the stars.